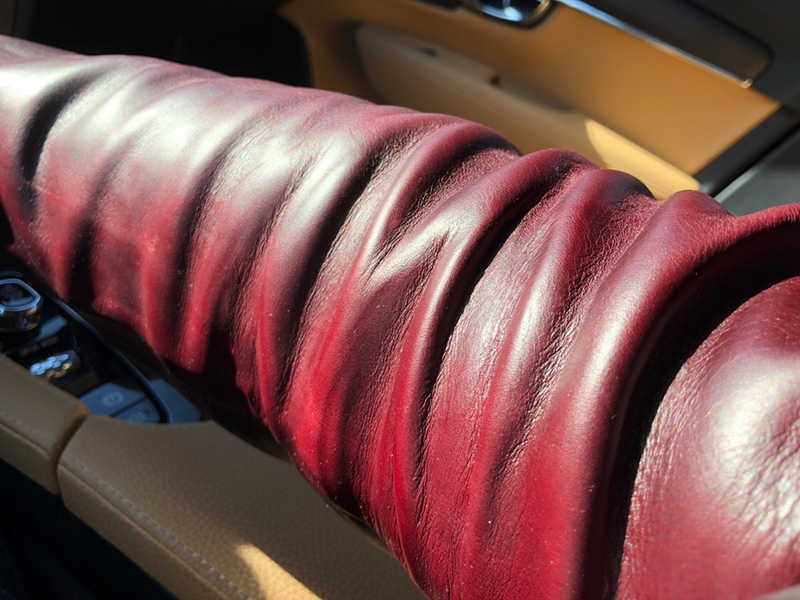 Discussion in 'Outerwear' started by hondurasdave47, Apr 16, 2019 at 2:12 PM. 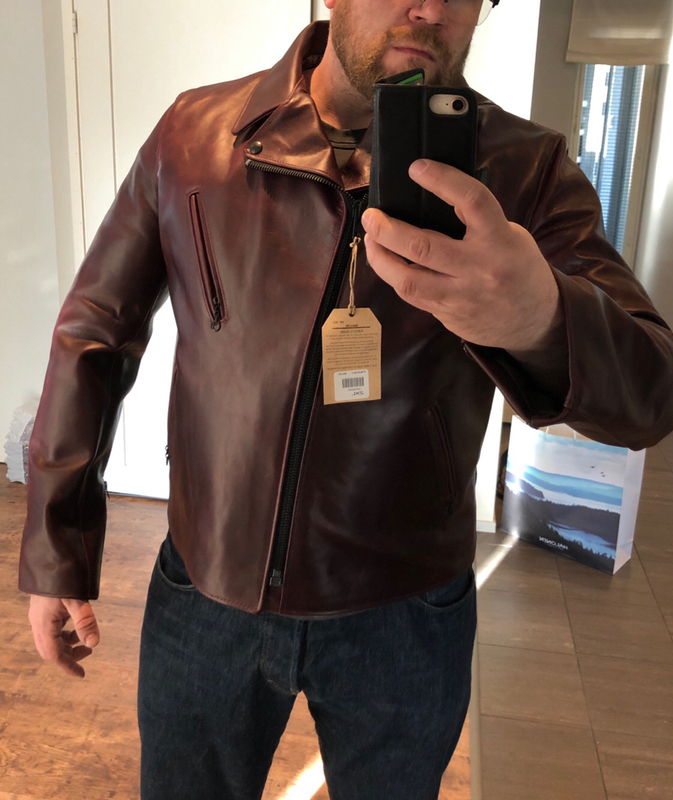 I love the clean look of the jacket but at $1,450.00, I feel like I can order the same leather/style from Thurston Bros and go completely custom for $200.00 - $300.00 less. Peacoat and ton312 like this. Agreed...that's just far too much money for a jacket you have zero input into the sizing. It's certainly a beauty...but. NO. Small detail compared to what's already been mentioned, but I'm not a fan of black hardware. The snaps are OK, I guess. But I don't care for black zippers and chain pulls. At least from the way they appear in the product photo. I had the chance to try that on. Talk about a suit of armor! You’d need daily tumbles down a hillside for a year just to be able to scratch your noggin. In fact, the Schott store is only about a mile from the now closed Radler. The Radler closed? Noooo. Also, I did visit the Schott store when I was there! I ordered one. It should arrive in couple of days. With code ”appreciation” one gets 15% off which makes the price little it more bearable. That said, if the fit is not damn near perfect, I’ll return it. dannyk, ton312 and hondurasdave47 like this. Please post a review when it arrives! I think you said it best in your first post Dave. 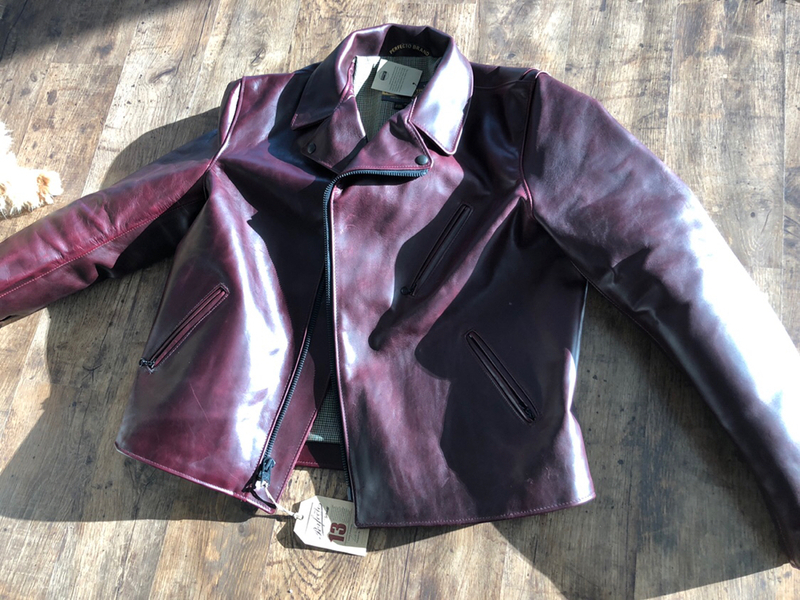 While that jacket does offer the immediate gratification of buying it and receiving in the mail within a few days, I think either a Ridley or a Bootlegger from Thurston Brothers would be a nicer and (for once!) less expensive option. hondurasdave47, lucky23 and ton312 like this. I agree. For that money I want some input on sizing and options. Yeah, Radz's HH has really got me considering that Midnight Blue CXL FQHH for a Crosszip! JMax, samo, dannyk and 4 others like this. Fit is good and the pattern works well for me. 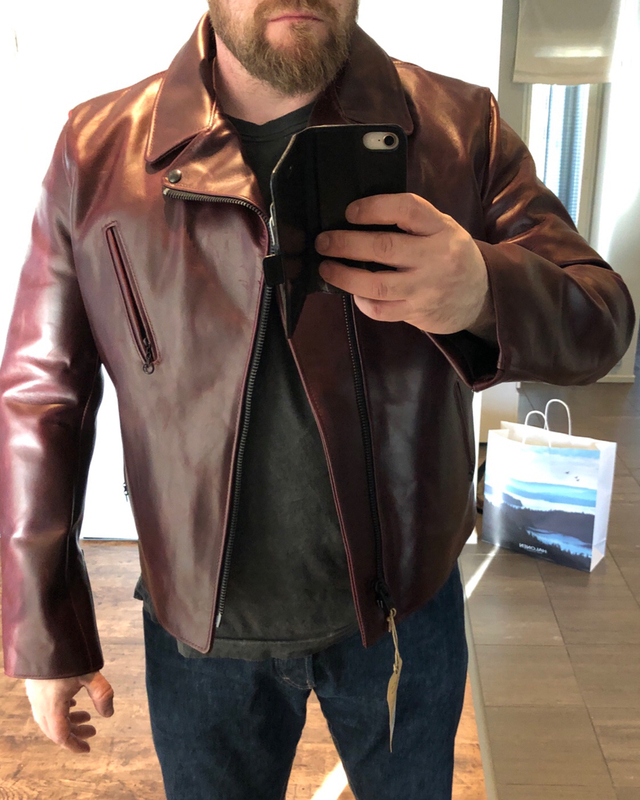 Leather is good old Horween CXL hh. 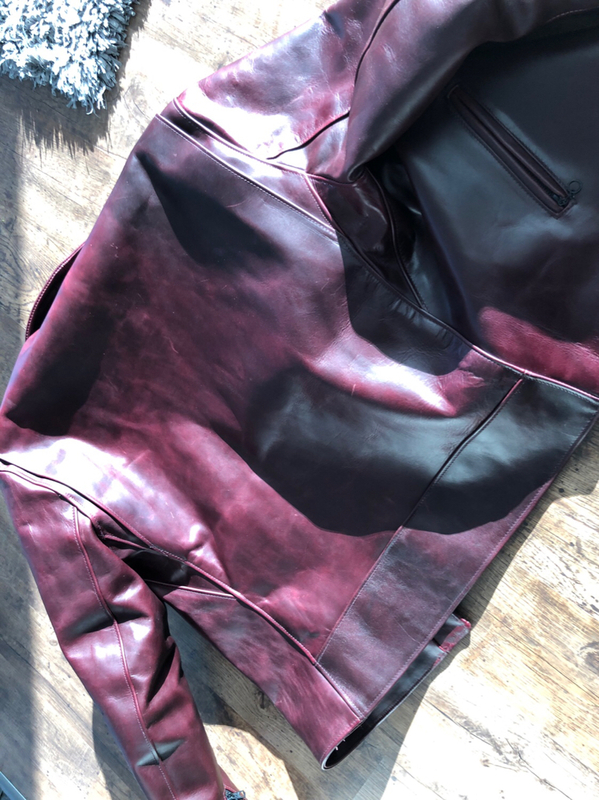 Just like Aero’s but maybe a touch heavier and the colour is more reddish burgundy than Aero’s cordovans that I have handled. Stitching quality while not perfect doesn’t have any flaws that would bother me. IMO the large modern Zipper is supreme in comparison to Aero’s zips. For me this alone is easily worth extra $200. All in all this one is a keeper for me and IMO worth the money. dubpynchon, samo, dannyk and 3 others like this. That is really nice! Beautiful hide and fit! Jejupe and hondurasdave47 like this. JMax, dannyk, Downunder G Man and 2 others like this. How much as this shorten your sleeve length? I think it could be shorten by 1/2 to 2/3 inch on you. Not more than 1/2 inch I’d say. Which is good, as the sleeves were a little bit too long to begin with.